I was at my doctor’s office just recently to attend for my yearly physical exam. The receptionist told me to arrive 15 minutes prior to my appointment as there would be a questionnaire for me to complete. When I arrived, I was handed a clipboard with a two page health questionnaire. Most of us are familiar with these. They have questions like our occupation, present or past medical conditions, changes in our medications et cetera. However, what was unique were questions about my diet and current exercise or recreational activities. 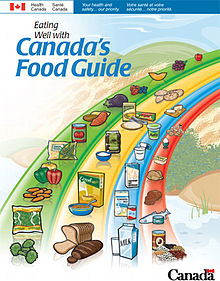 As well, what was attached to this questionnaire was the Canada Health Food Guide. I was asked on the questionnaire to list the serving sizes of the different categories of foods I consume on an average day and week as well as how much exercise I was performing. So, rather than my doctor telling me to eat right and exercise, which would have been one ear and out the other, I was asked to compare my health habits to today’s minimum standard, the Canada Food Guide. I found this extremely convicting and eye opening because it had been long time since I had looked at the Canada Food Guide! I am often asked what condition I see most often in my practice. The answer is a resounding “Low Back Pain” and when coupled with neck pain, pain coming from the spine is the most common problem in most physiotherapists’ caseloads and the primary mechanism of injury isn’t trauma or accident but from a sedentary lifestyle. Yes, active people experience back pain as well but by far, the problems that a sedentary lifestyle creates far outweighs the problems created by an active one. What is the most effective way to achieve the bare minimum 150 minute per week recommendation of moderate to vigorous exercise? You decide. Whatever it is, just do it and make sure it’s fun otherwise, it will become a chore and you will soon discover that that “gym pass” will sit idly in your drawer along with our other lists of good intentions. In our next newsletter, we will address the physiological benefits of strength training to muscle fibers and its impact on muscle tightness, pain and function.